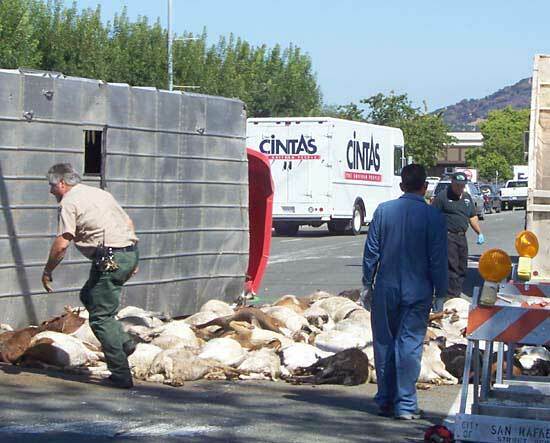 On July 6, a 32-foot long trailer truck carrying more than 400 goats crashed in San Rafael, Calif. 243 of the goats died. Apparently, the goats were in 4 levels of compartments, which collapsed during the crash. Elliot Katz, DVM arrived soon after the crash and claimed that the police refused to open the trailer doors for fear of causing another traffic accident. This left the goats piled in the truck for over an hour. IDA president Elliot Katz, DVM also arrived soon after the crash. “There was horrible screaming coming out of the truck from all the animals suffocating under the weight of others,” he said. Still, police refused to open the trailer doors for fear of causing another traffic accident. Meanwhile, hundreds of goats suffered inside for almost a full hour, piled one on top of another, slowly and painfully asphyxiating to death, before the doors were opened. The goats were owned by Goats R Us, who rents them out to graze and clear away brush which can ignite in hot weather and start fires. “Those goats didn’t have die,” said Terri Oyarzun, owner of Goats R Us, the company which “owns” the goats and rents them out to graze and clear away dry brush, which can ignite in hot weather and start fires. Oyarzun had herding dogs on hand, so the goats could have been corralled away from traffic, but police ignored her objections and kept the doors locked. Some of the surviving goats were found grazing on lawns nearby. Several IDA staff members and other onlookers also soon gathered at the scene, and stood shocked and appalled behind yellow police tape as they witnessed the carnage. Bystanders watched officials pull both living and dead goats from the trailer wreck, then stack the victims’ mangled corpses ten-deep in the street. 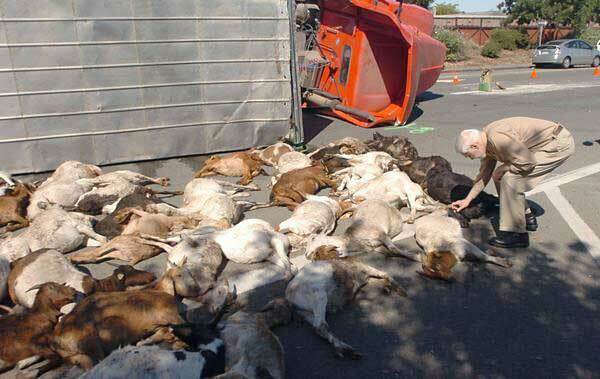 Eventually, officials let Dr. Katz assist with rescuing the still-living goats from among the piles of dead and dying. Ultimately, there were about 150 survivors, some of whom were found grazing on lawns in the neighborhood nearby. The driver and passengers were not injured. From the IDA website, which is an organization dedicated to protecting the rights, welfare, and habitats of animals. Their site gives a somewhat more political account of the accident.